Home > 2017 > DARTSLIVE > Barney, the world's leading player playing DARTSLIVE2! Raymond Van Barneveld has won 5 world championship titles of PDC and BDO. This one of the world's leading players is also called as “Barney”. DARTSLIVE2 is installed in Barney's training room! I watched DARTSLIVE.TV MATCH and GLOBAL MATCH campaign was also ongoing using the online match system. I got interested in the machine. 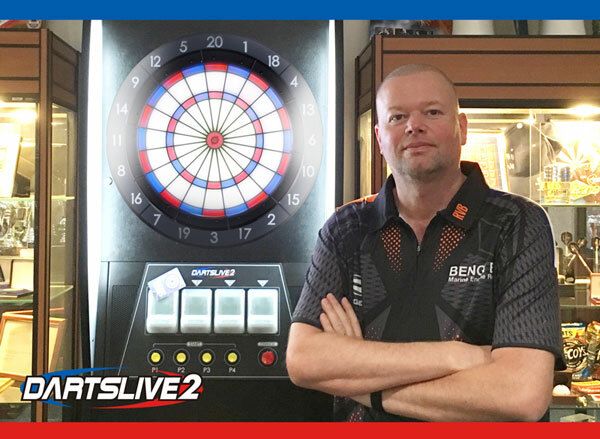 As he hinted in his comment, Raymond Van Barneveld will be in GLOBAL MATCH on DARTSLIVE2!